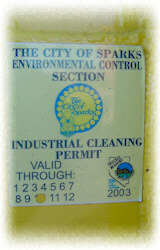 Car Wash Guys have received the official environmental certification sticker from the City of Sparks, Nevada. We are the only mobile car wash to have such a permit and to have passed all the necessary criteria. Nice to have a closed market and no competition. we are finding this becoming more and more likely as we watch environmental requirements become more stringent which disallows competitors from entering the market with inferior reclaim equipment and BMPs.